Five North American manufacturers have been singled out by the Insurance Institute for Highway Safety (IIHS) for their strides in preventing a range of deadly underride crashes. Semitrailers from Great Dane, Manac, Stoughton Trailers, Vanguard National Trailer, and Wabash National have earned the new IIHS TOUGHGUARD award. An underride guard is the metal bumper that hangs from the back of a semitrailer. The idea is to stop a smaller vehicle from sliding under a high-riding trailer in a rear-impact crash to preserve survival space for the people inside the lower-riding vehicle. While all underride guards must meet federal safety standards, IIHS research and crash tests have shown that many underride guards can buckle or break off in a crash. When guards fail, the resulting underride crashes often result in death or serious injury to people in passenger vehicles. "Our research told us that too many people die in crashes with large trucks because underride guards are too weak," said David Zuby, the Institute's executive vice president and chief research officer. "So we designed crash tests to replicate scenarios where guards have failed in real-world crashes. At first, only one of the semitrailers we evaluated passed all three tests -- the Manac. Now five trailers do. Manufacturers really took our findings to heart and voluntarily improved their guard designs." The TOUGHGUARD winners have rear guards that prevent underride of a midsize car in three test modes -- full-width, 50% overlap, and 30% overlap. In each configuration, a midsize car travels at 35 mph toward a parked semitrailer. In the full-width test, which is the easiest to pass, the car strikes the center of guard head on. In the 50% overlap, half of the car's front end strikes the guard. In the toughest test, 30% of the front of the car strikes the trailer at its outermost corner. Underride guards are weakest at the outer edges of a trailer. The TOUGHGUARD award is the culmination of six years of IIHS research and testing. 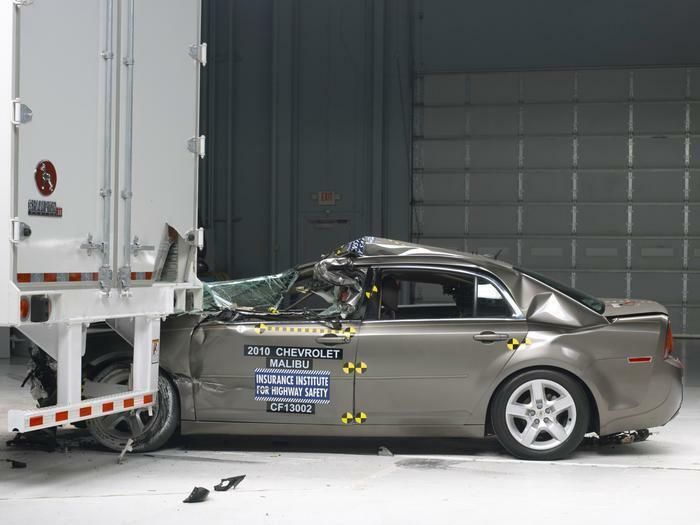 IIHS began its underride crash test program in 2011 and has since evaluated multiple trailers from eight of the largest trailer manufacturers in North America.